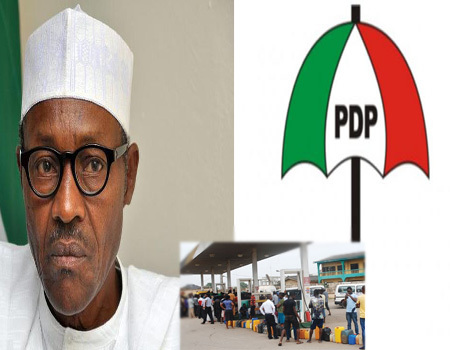 THE Peoples Democratic Party (PDP) has challenged the Federal Government and the All Progressives Congress (APC) to tell Nigerians the truth regarding the handling of fuel-related funds, particularly reports of 18 unregistered companies allegedly used to lift and divert $1.1 trillion worth of crude oil in the last one year. The party also alleged that the Federal Government was providing cover for “huge sleazes directly involving APC interests” in the ongoing fuel crisis in the country. It also admonished government officials to stop “dishing out” falsehood to suffering Nigerians. The PDP charged the government to tell Nigerians the truth regarding its handling of fuel related funds, instead of dissipating its energy on name callings. “This APC government is not only grossly incompetent and corrupt but also a champion in the use of lies and manipulations against innocent and unsuspecting citizens. “We all know that it was convenient for the APC Presidency to promise Nigerians that it will no longer import fuel, only because the PDP government had already laid the foundation, including revamping the refineries and ensuring a domestic production of five million litres out of the 25 million litres daily domestic consumption. “Sadly, this incompetent APC government, in its almost three years, has not added one litre to the five million litres which the PDP administration was producing. “Instead of improvements, the APC has wrecked the system and now pushing the nation to depend solely on importation, while engaging in heavy sleazes in hidden subsidy regimes,” the statement read.